Kountze, Texas, Hardin County Seat, history, landmarks, featured articles. The town was named for the Kounte Brothers, Herman and Augustus - railroad investors in the Sabine and East Texas Railroad. The railroad served a string of lumber towns, most of which have faded into oblivion. A post office was granted in 1882 and although Kountz was defeated in an election for county seat, a courthouse fire in 1886 made the voters rethink their decision. 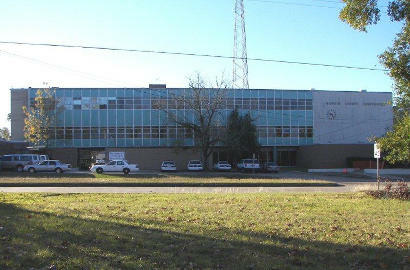 Kountze became the county seat in 1886. The year 1902 saw the arrival of the Gulf, Colorado and Santa Fe Railway – making Kountze a railroad crossroads. 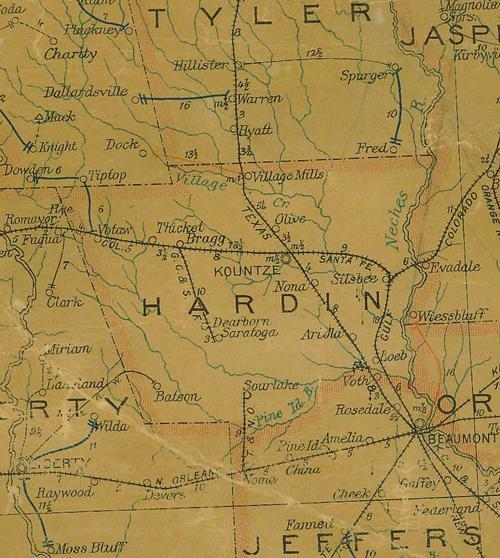 The population in 1910 was over three times the 1890 population and Kountze was wired for electricity while much of Hardin County remained in the dark. The town suffered a fire in 1916 just as the forests were thinning out. Silsbee grew as Kountze’s rival, preventing Kountze from an economic dominance. Archer Fullingim, a newspaperman who started the Kountze News on a hand-fed press in the 50s, became a self-appointed spokesperson, and champion of Hardin County and the Big Thicket in the 1960s. The Legend of the Olive Ghost Train by W. T. Block Jr.
"... It was a bright moonlight night that October 30th when Tim Hargraves reached Beaumont, and he went straight to a booth and asked for a ticket to Olive, north of Kountze. The ticket master inquired, "A ticket to Olive? Why, that's a ghost town, and all the houses except 2 or 3 are gone. The East Texas Railroad passes nearby, but are you sure that's where you want to go?..." 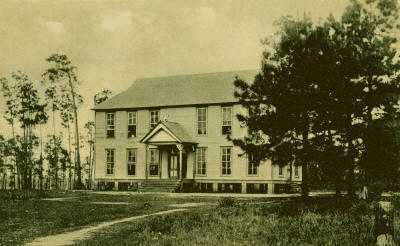 Three miles north of Kountze, in Hardin County, Texas, where once the burly and towering pine trees shaded the forest floors beneath them, the town of Olive thrived between 1881 and 1912.